The Myriad TPC LITE is a smaller I/O version of the full size TPC. It operates constant or variable speed pumps. 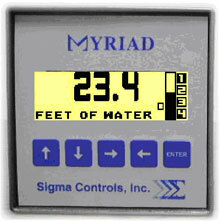 The Myriad TPC LITE ushers in a new generation of pump controllers. From the ¼ Din 4” X 4” housing with fully removable P.C. board, to the 128 X 32 pixel bitmapped LCD display and simple user set up, the Myriad TPC LITE offers pump control and management for up to 3 pumps. The unit accepts two analog input signals. Relay outputs may be configured for pump control and alarms and are front panel programmable for ‘set’ and ‘reset’ points.